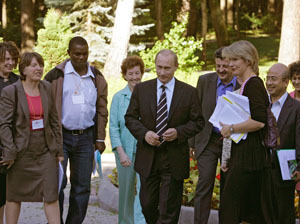 In his Moscow residence the President met with the heads of famous international non-governmental organisations such as Human Rights Watch, Amnesty International, Transparency International, Green Peace International, the World Wildlife Fund, the International Council of Women and others. 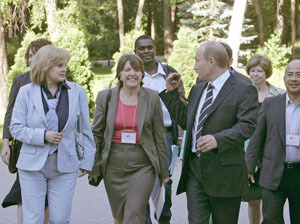 The chairwoman of the Presidential Council for Facilitating the Development of Civil Society Institutions and Human Rights and coordinator of the national working group Civil G8 2006, Ella Pamfilova, introduced the visitors to Vladimir Putin. When opening the meeting the President suggested thinking about establishing a mechanism to facilitate dialogue between the leaders of G8 countries and international non-governmental organisations. I would like to welcome you once again. I am very glad to have the opportunity to continue the informal discussion we began today. You represent truly global non-governmental organisations that address the widest possible range of problems: the environment, human rights and other important problems for humanity. The activities of your organisations take place within state borders. I already said quite a bit about this afternoon so I won’t take up your time with a long monologue. I think that during our informal meeting we were able to talk about all the problems that interest you. I am familiar with the documents that you have prepared. I know that you wish to express your opinions to the leaders of G8 countries concerning these and other problems, and about your willingness to hold and organize meetings. This afternoon I already said that, unfortunately, there is too much bureaucracy associated with such meetings and one would have to spend a long time consulting with the offices of protocol and the ministries of Foreign Affairs. Nevertheless we are ready to discuss this issue with our colleagues especially within the Sherpa groups. In any case you can be assured that I will share your main ideas with my colleagues. Perhaps we will come up with a format to facilitate permanent cooperation, and draw attention to the problems you engage with and which you would like to bring to the attention of the leaders of G8 countries. That is all that I wanted to say as an introduction. This evening I hope we will be able to talk openly and in detail.